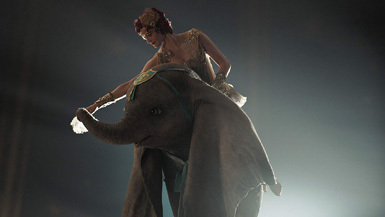 Disney's latest attempt at turning one of their animated properties into live action does take the weekend title, but Dumbo doesn't open as strongly as they'd hope, as we wrap up March suddenly again having doubts about 2019's box office. As Kim Hollis wrote yesterday, as some films struggled early on in the year, we were pretty sure that horror purveyors Blumhouse and Disney films were the only surefire bets for the rest of 2019. Well, Blumhouse's Glass stumbled over the $100 million mark while Happy Death Day 2U's total box office ($28 million) barely topped the opening weekend of the original (making it still profitable, but massively disappointing. Meanwhile, Disney, still riding high on Captain Marvel's box office (more on that in a bit) unleashed the first of their three (THREE! And four if you count Maleficent, which gets a sequel in the fall) live action adaptations of classic animated films this weekend, and suddenly, we're pretty worried again after the good news Captain Marvel and Us had brought. After the success of 2016's The Jungle Book and 2017's Beauty and the Beast, Disney lined up several live action mashed with CGI films for the future, and three of them arrive this year, with one already a big internet punchline two months ahead of its release, but the first one to make it to theaters was Tim Burton's Dumbo. Winning the weekend with $45 million, the main reaction seems to be "well, that could've gone worse." The story of the baby elephant with the giant ears is, weirdly, one of the lesser known Disney properties at this point, and that might be the primary contributor to the weekend. It's one of the older Disney films, and there was never a sequel. Uses of the character have been minimal, so I would wager recognition among younger viewers was low. Also, it was mainly relying on Burton's visual style to sell it, and that can be very hit and miss. Also, while a family film and largely review proof, the 50% Fresh rating at Rotten Tomatoes didn't help the performance. Dumbo's weak opening weekend is problematic for the normally bulletproof Disney, who also have live action adaptations of Aladdin and The Lion King slated for later on this year. One's a sure thing (we think) to be one of if not the biggest hits of the summer, but the other's already a laughing stock ahead of its Memorial Day weekend release. The shrug emoji that Dumbo's release elicited does not bode well for a blue Will Smith, but we'll get there when we get there. The other problem here is Dumbo's reported price tag was $170 million. While it also opened internationally this weekend to okay results, it's got a long uphill climb to profitability. Us slides 53% to $33.6 million, giving it $128.2 million in two weekends. It's not Get Out's ridiculous 15% decline from opening weekend, but we're also dealing with bigger numbers (and it's ostensibly a horror movie) so it's fine. The second weekend of Us matches Get Out's opening weekend, and anyone complaining about that is ridiculous. Jordan Peele is his own brand now, and with the coming Twilight Zone update that is getting good reviews already, he's got carte blanche to do whatever he wants at this point, and good for him. Captain Marvel adds $20.5 million (down 40%) this weekend and has $353.8 million after four weekends. It continues to chug towards $400 million, with the goal being $409 million, enough to pass both Iron Man 3 and Captain America: Civil War to place it fifth all time among Marvel movies (but only for about a few weeks). Five Feet Apart is finding its target audience as it drops just 27% in its third weekend to $6.2 million and has $35.8 million to date. As a bonus, it cost just $7 million, so it's a big winner for Lionsgate. We get another opener in fifth place as faith based entry Unplanned overperforms with $6.1 million in just 1,059 theaters. The story of a former Planned Parenthood employee who became a fierce anti-abortion advocate, the weekend total is the best opening weekend for a Pure Flix Entertainment film since God's Not Dead 2, which took in $7.6 million on this weekend 2016. Unplanned's success is surprising because the film landed an R-rating and advertising was limited due to the film's topic. It should fall swiftly from here, but did make its budget back on opening weekend. Wonder Park earns $4.9 million and has $37.8 million after three weekends. The theatrical pilot for a future Nickelodeon television show continues to struggle, and remains far away from its $80 million budget. How to Train Your Dragon: The Hidden World earns $4.2 million in its sixth weekend and has $152.9 million to date. Still on track for about $170 million, it's a microcosm of modern box office in that it can open bigger than the previous two films, but finish with less than both of them. Hotel Mumbai is another weekend surprise as it earns $3.1 million in 924 theaters after expanding from a four theater NY/LA release last weekend. The based on a true story film starring Dev Patel and Armie Hammer, it's got limited appeal to most audiences, but the targeted expansion worked to capitalize on a weak top ten. Tyler Perry's A Madea Family Funeral adds $2.7 million to give it $70 million in five weekends. It's got a few million more to go to make it the second biggest film of his career, after 2009's Madea Goes to Jail, which made $90 million. A final new release lands in tenth place, as Harmony Korine's The Beach Bum flops in with $1.8 million in 1,100 theaters. Starring Matthew McConaughey, stuff and things happen and if you know anything about Korine's previous works, it's kinda hard to explain. Despite the weak performance, it's the second highest grossing film of the absolute-opposite-of-commercial Korine's career, after 2013's Spring Breakers earned $14.1 million. The top 12 films this weekend earned $130.3 million, just ahead of last year's $120.8 million, when Ready Player One started off with $41.7 million. Next weekend we flip the calendar to April and get the two most important releases of the month that aren't called Avengers: Endgame. DC goes big (literally?) with Shazam, while for horror fans, we get an update of Stephen King's Pet Sematary.